"Eggrobo" redirects here. If you were looking for the final boss from Sonic Lost World, see Eggrobo (Sonic Lost World boss). 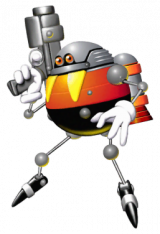 Eggrobo (エッグロボ), or occasionally Eggmanrobo in Japan, are android badniks who make their first appearance in Sonic & Knuckles' Sky Sanctuary Zone. Shaped like an egg with arms and legs (clearly made to resemble Dr. Eggman), Eggrobos hover in place and attack with a laser pistol. In Sonic or Tails' stories through Sonic 3 & Knuckles, Eggrobos are first seen during the cutscene at the start of Sky Sanctuary Zone, launching from the Death Egg's equatorial circumference as the great battle station climbs back into space under the power of the Master Emerald. 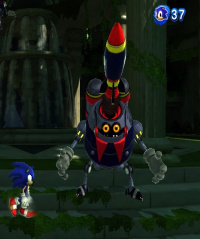 These rotund badniks are the only foes (bar Mecha Sonic) to be found in Sky Sanctuary. The Eggrobo in Sky Sanctuary are seemingly much less resilient to attack than the one Knuckles spends his duration of the story fighting, due to them only needing one attack to destroy. For Knuckles, however, one of these badniks plays a more integral story role. 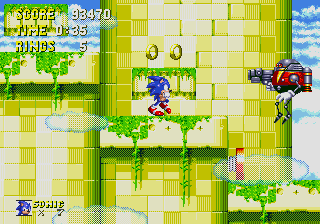 While Sonic and Tails deal with Eggman himself throughout S3&K, the echidna's boss fights feature an Eggrobo piloting the boss machines during every level except for Flying Battery Zone (and, occasionally, Mushroom Hill Zone). It is unknown canonically why this EggRobo is piloting Dr. Eggman's vehicles unless it either thinks it is Eggman or Dr. Eggman simply gave it commands to do so. Most likely, it was commanded to get the Master Emerald back. This Eggrobo may be the Eggrobo that emerges from the pile of destroyed Eggrobos in Sonic and Tails' Chaos Emerald only endings as Knuckles' storyline takes place after the events of Sonic and Tails'. Eggman created this robot intending to surpass his strongest robots, including the other Metals. However, it demonstrated its true strength on its first mission: thanks to its comical body, it ignores air resistance . . . Eggman boasts of the offensive abilities he gave it, and it still matches Metal Sonic's speed. [Appearance requirements] Collect 5 tokens in Regal Ruin in Grand Prix mode and finish better than fourth place to begin a one-on-one match with Eggmanrobo. Win this race and Eggmanrobo will become a possible choice on the character select screen. Low turning ability. Use Buttons effectively to struggle through corners. On the water, deceleration occurs immediately. Hurry to land to recover. Eggmanrobo has a huge body. When a course is difficult to see, press the button to change your viewpoint. In the original Dreamcast version of Sonic Adventure 2, Eggrobo could be downloaded in Eggrobo Kart Racing as a playable character for use in the Kart Racing minigame. In the GameCube and 2012 versions, he had to be unlocked for use in the racing minigame by clearing all of Rouge the Bat's missions. He was not part of the game's actual story or any normal stage. An indigo Eggrobo opening fire. In Sonic Generations (HD), the hedgehog revisits Sky Sanctuary Zone to be confronted by the classic Eggrobo opponents. Some of the robots use their rifles rather more dangerously, now, firing not one beam of light but several at once. In addition, and lacking any official name, variant Missile Eggrobos are enemies found only in this level. Whereas in the original level, the only enemies to appear at all were the classic red/yellow Eggrobos, Act 2 of the Generations stage mixes things up by adding these new. indigo/red versions. 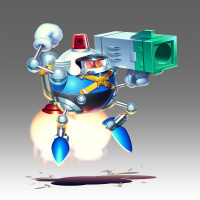 Missile Eggrobos don't carry the Eggrobos' standard laser rifle, instead firing homing missiles out of the top of their heads, which pursue Sonic with some tenacity. In Sonic & All-Stars Racing Transformed, Eggrobos appear as obstacles that racers must avoid in Sanctuary Falls. The Hard-Boiled Heavy named the Heavy Gunner. While no Eggrobos are fought as normal enemies in Sonic Mania, there are a group of Eggrobos known as the Hard-Boiled Heavies who are essentially an elite group of Eggrobos modified by the power of the Phantom Ruby. One of these, the Heavy Gunner, pursues the player as the miniboss of Studiopolis Zone, accompanied by four other Eggrobos (three wielding batons and one flying his helicopter). All of these are destroyed in the course of the battle, though Heavy Gunner escapes. In addition, in certain places of Titanic Monarch Zone, there are rocket cars controlled by crash test dummy Eggrobos that accelerate until colliding with a wall, destroying both the car and the Eggrobo but not harming the player; these are frequently required to cross gaps or obstacles. Eggrobos make an appearance as enemies in the Smash Run mode in Super Smash Bros. for Nintendo 3DS. They'll fly around the place and attack players by firing several quick blasts or a large laser beam while keeping their distance. When Eggrobos appeared in the Archie Sonic the Hedgehog comic books, they were referred to as "Eggbots." In issue 54, Snively controls a group of Eggrobos which he uses to stop Sonic the Hedgehog and locate Ixis Naugus. Eggrobo in Sonic Adventure 2's Kart Race. Eggrobo Concept Artwork in Sonic Generations. Eggrobo statue in Sonic Generations. Eggrobo Trophy in Super Smash Bros. for 3DS. Eggrobo riding a rocket car with Sonic on board in Sonic Mania. This page was last edited on 3 November 2018, at 07:24.